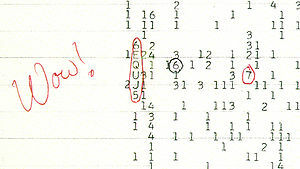 The Wow!-Signal was recorded on 15. August 1977 by the "Big Ear" radio telescope at the Ohio State University. To this day, the origin has never been completely discovered. Judging by the alignment of the „Big Ear“ radio telescope towards the sky and the earth’s rotation one can assume that it is almost certainly an interstellar signal. Its origin derives possibly from the direction of the constellation Sagittarius. Thus the signal had travelled at least 122 years. The name of the signal comes from the "Wow!" commentary on the computer printout by J. R. Ehman who analysed the signal. The character string 6EQUJ5 shows the progression of the strength of the signal. SETI@home (Search for extraterrestrial intelligence at home) is a distributed-computing project of the University of California in Berkeley, which deals with the search for extraterrestrial intelligent life. It is looking for narrow-band radio signals from space, since it is assumed that these signals are not of natural origin. The discovery of such a signal would indicate the possible existence of extraterrestrial technology. Unlike other SETI projects SETI@home is a very inexpensive project. In conventional SETI projects promising sections of the sky can be selectively searched for radio signals from aliens. SETI@home instead equipped the radio telescope at Arecibo Observatory, which is used for astronomical observations, with an additional receiver and will record radio signals while the telescope is making other scientific observations. SETI@home therefore receives a large amount of radio data, without taking up its own telescope time. To evaluate the vast amounts of data, only little own hardware is required. The computational burden is instead outsourced to the SETI@home computers in the global community. Since 1999 the participating computers provided more than 2,3 million years of computation time. During this time, more than 1,84 billion results from more than 5,4 million users have been received. SETI@home thus has become a model for other projects in medical and scientific fields, such as Folding@home or the Cancer Research Project. algorithms and data formats by automatically recharging a new version from the SETI@home server. The countdown shows how long it will take until the beginning of the SETI@Home-Wow!-Event 2019. After the start of the event the displayed time is the time until the end of the event. From when to when will the SETI@Home-Wow!-Event 2019 take place? Every Tuesday Seti@Home has a weekly planned downtime. During this time no WU can be downloaded or returned. To bridge this time you can adjust your bunker to a suitable time level in the Boinc Manager. A maximum working buffer (bunker) of 10 days is possible. What is the meaning of the group names? When you register for the event you have to choose between 12 groups. The groups have been named after the signs. Here you can register yourself (it is also possible during the race). You need your nickname and your User ID. Both can be found in your account on the Seti@home page. You are also given a choice which of the 12 groups overall you wish to join. More detailed information about that can be found here. An overview of those participants who have already registered has been embedded. The initial setup is for an alphabetised search of users. The causes possible are: Wrong Nickname or User ID. Please check your given data. They have to match with those in your account on the Seti homepage. If a registration is still not possible you can inform us about it via the contact page. 0 The User_ID already exists in the Event database. Du bist bereits registriert. Du kannst dies über die Suchfunktion prüfen. 1 The User_ID already exists in the Event database. Du bist bereits mehrfach registriert. Bitte teile uns dies über das Kontaktformular mit. 10 Abruf der Seti-User-Datenbank nicht möglich. Es konnte keine Prüfung der Seti-DB durchgeführt werden, evtl. wegen Wartungsarbeiten in Berkeley. Probier es bitte zu einem späteren Zeitpunkt erneut. 50 The User_ID already exists in the Event database. Du bist bereits registriert, evtl. wurde versehentlich die Anmeldungsanfrage durch den Browser doppelt übermittelt. 136 The User_ID couldn't be found in the Seti user database. Die eingegebene User ID konnte nicht erfolgreich validiert werden, bitte prüfe deine Eingabe der User ID. Which statistic is decisive for the SETI@Home-Wow!-Event? The event will have its own statistic on the homepage of SETI.Germany. An update will occur every hour. Which results count for the SETI@Home-Wow!-Event? All WUs which are validated during the race will count for the event. It is therefore not only allowed but welcomed to collect pending credits before race start! What kind of statistics will be available? There are some for individual participants, groups, teams and countries. For all charts you get a tool-tip containing more detailed information if you point your mouse at it, and they are also zoomable using the left mouse button. The data are updated every hour. Event cockpit: Here you'll find the credits gained during the Wow! Event by all participants and the respective graph. Space-race: Like at the Olympic games, the different groups are awaiting the start of the Wow! Event in the different lanes. As soon as the starter's gun is fired, the race towards E.T. begins. According to its pace (calculated according to the credits gained) one or the other group lies in front. Maybe we will also get a start/finish victory. Who knows? The news ticker will keep you informed with exciting comments. You can search for any of the participants of the Wow!-Event who have registered. Choose one of the participants in the selection field with your mouse followed by a click on the “Search” field. What is the contact page? The organisers of the Wow-Event are continuously striving to rectify emerging faults and sort out problems. To achieve this, we need your help. That’s why we have provided this page. To enable us to get in touch with you. Your email address will be handled confidentially by Modesti and shka and will only be used during the event. The details will be erased immediately following completion of the event!